Maxi Cosi CabrioFix Car Seat + FamilyFix Base make travelling with your infant a breeze. The Maxi Cosi CabrioFix is suitable from birth to 12 months whilst the base will last you for 4 years. This is because once your little one has grown out of the CabrioFix the base is also compatible with the Group 1 Pearl Car Seat. The Maxi Cosi CabrioFix Car Seat + FamilyFix Base includes the Maxi Cosi CabrioFix Car Seat and the Maxi Cosi FamilyFix Base. Why should I buy Maxi Cosi CabrioFix Car Seat? The Maxi Cosi CabrioFix Car Seat is a Group 0+ Car Seat that provides your baby with a little bit of luxury. With a removable support pillow, head-hugger for smaller babies and belt pads, you can ensure a snug fit will always be provided for baby. With Maxi Cosi's Side Protection System, you can be confident that this Car Seat offers optimal protection in side collisions or impacts. Belt hooks keep the harness out of the way for easy in and out with baby, whilst the harness adjustment includes a one-pull feature. With a convenient carry handle for parent and a handy storage compartment, you can have fun on the go with the CabrioFix. This Car Seat fits all Maxi Cosi and Quinny Pushchairs to form a practical and stylish Travel System. This Group 0+ Car Seat is easy to install using either your vehicles 3-point seat belt or ISOfix with the use of a Car Seat Base. The CabrioFix has received excellent test ratings with the 2wayFix, FamilyFix and EasyFix base units. The CabrioFix used on the FamilyFix Base offers an extra upward position. This gives baby extra leg room, allowing for longer and safer rearward facing travel. Last not but least, the cover of this car seat is fully removable for washing! This car seat is approved according to the latest European safety standard ECE R44/04. Why should I buy Maxi Cosi FamilyFix Base? The Maxi Cosi FamilyFix Base provides you with long lasting value and convenience as this base can be used over the first two consecutive stage of car seats (Group 0+ Car Seats and Group 1 Car Seats). This features makes the Maxi Cosi FamilyFix Base suitable from birth to 4 years. It includes an incredibly simple yet safe ISOfix installation, which features light and sound confirmation of the correct installation. This Car Seat Base offers unique positions for both Maxi Cosi Pebble and Maxi Cosi CabrioFix (Group 0+) as well as Maxi Cosi Pearl (Group 1) Car Seats. For Maxi Cosi Pebble and CabrioFix, an extra upward position is available. Whilst for Maxi Cosi Pearl, five comfortable recline positions from sitting to sleeping become useful. A low battery warning signal flashes when energy drops below 30%. The Maxi Cosi FamilyFix Base still functions on an empty battery, however replacement is highly recommended in order to retain the light and sound safety check. 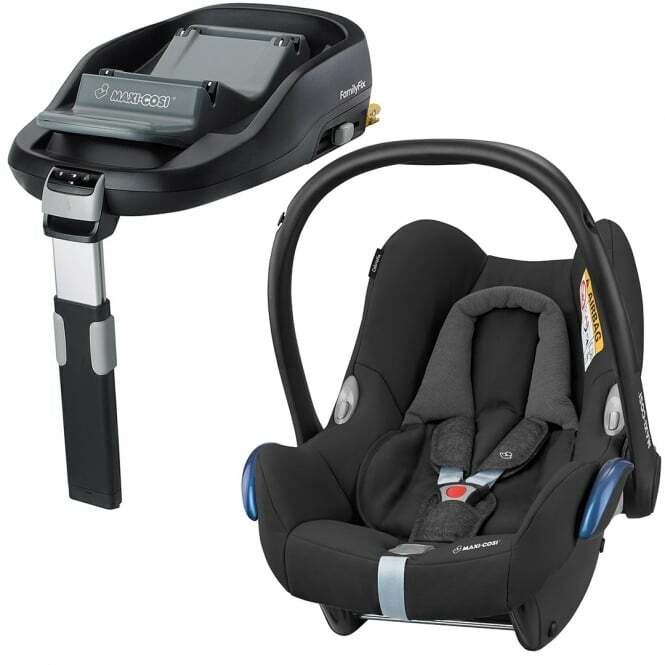 Maxi Cosi offer a lifetime warranty if purchased from 1st January 2016 - you must register within 3 months of purchase. A 2 year warranty is offered if lifetime warranty is not applicable. This applies to UK mainland only.